Over 29 million people in the United States are diabetics. In that number, 8 million people may not even be aware that they have the condition. Diabetes affects your body in ways that if not properly managed can increase your risk to multiple illnesses. Although the name of diabetes rings a lot of bells not many people without the condition know much about the disease. Today, we would like to raise awareness by going over some of the risk, symptoms, and present management tips when dealing with diabetes. Diabetes affects the body’s ability to produce or respond to the hormone insulin is impaired. This causes an abnormal metabolism of carbohydrates and elevated levels of glucose in the blood and urine. When this happens you are confronted with many risks, when left untreated diabetes can lead to stroke, loss of consciousness, visual disturbance, high blood pressure and much more. When you’re a diabetic your pancreas produces slim to nothing of insulin, which causes your cells to lose out on needed energy. Diabetes also has two types affecting your body differently. Diabetes Type 1 diabetes is an immune system disorder. Type 1 causes your immune system to attack the cells that produce insulin in your pancreas. Since your body cannot produce anywhere near enough people with Type 1 have to take insulin directly. Type 2 can be a result of a bad lifestyle & dietary habits. Due to the pancreas using insulin wrong, most type 2 people end up needing insulin. Regardless of the type of diabetes, you have its important to meet with a specialist so you can make a plan and take action to maintain a healthy lifestyle while living with diabetes. There are plenty of things you can do in order to live a better life as a diabetic. The first thing you can do is getting educated on what diabetes is. Talking to Your health specialist can help you better manage your health day by day creating a plan including diet, fitness, and medication. 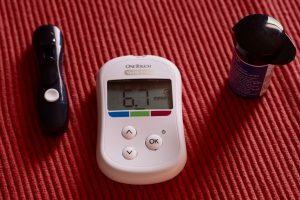 Learning what can raise your blood sugar or stress is important as well as knowing what foods can help provide you with the nutrients and fewer fats and sugars. Find an accountability partner who will help you make progress while learning to take care of your diabetes. You’re the team leader of your health and if you’re not keeping track there’s a good chance no one is.